If you really want to get to know a city’s history, lace up your walking shoes. Urban historic trails offer a scenic way to learn about a city’s evolution, experience its character, and discover its architecture, landmarks, monuments, parks, natural wonders, and local businesses—up close and at your own pace. Boston’s Freedom Trail, one of the most famous examples, is marked by a red brick stripe in the city’s sidewalks. It winds through downtown for 2.5 miles and passes 16 historic sites, including the location of the Boston Massacre; Paul Revere’s house; and the Old South Meeting House, where Colonists gathered before staging the Boston Tea Party in 1773. The trail was established in 1951 by a group of Bostonians who wanted to highlight the city’s preserved historic buildings; today an estimated 4 million-plus people visit it each year. Further down the East Coast, in the Baltimore National Heritage Area, four trails crisscross some of the city’s most historic neighborhoods. The 3-mile Heritage Walk passes through the Inner Harbor, Little Italy, Historic Jonestown, and the central business district, and connects 20 historic sites and museums, including the USS Constellation and the Jewish Museum of Maryland. The Mount Vernon Cultural Walk is a 3-mile tour of the businesses and attractions along Charles Street, such as the first Roman Catholic cathedral built in the United States, the Baltimore Basilica, which was consecrated in 1821. For a look at the city’s civil rights legacy, try the 2-mile Pennsylvania Avenue Heritage Trail. The Historic Fell’s Point Trail winds around the waterfront and narrow streets of one of the city’s oldest neighborhoods. Washington, D.C.’s Neighborhood Heritage Trails program offers 17 different self-guided walking tours, each marked by a series of informational signs with stories, maps, and historic photos. The Cultural Convergence: Columbia Heights Heritage Trail, for instance, highlights the neighborhood’s early beginnings as an elite suburb and takes urban explorers past the grand Tivoli Theater, built in 1924, and the 1910 mansion that now houses the city’s Mexican Cultural Institute. Stops along the City Within a City: Greater U Street Heritage Trail spotlight the neighborhood where Duke Ellington once lived and the legendary jazz clubs where the likes of Cab Calloway and Sarah Vaughan performed. 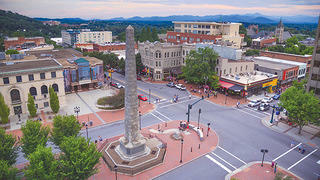 Pack Square is the first stop along North Carolina’s Asheville Urban Trail. Like Boston’s Freedom Trail, the Asheville Urban Trail in Asheville, North Carolina, was born out of a local effort to show off the city’s history and engage visitors. In 1989, city staff and residents joined forces for a major downtown revitalization, and 13 years later they debuted what would become a 1.7-mile self-guided trail. Thirty stations feature sculptures—many by local artists. Historic markers explain the area’s development; its eclectic architecture; and its historical figures, including Thomas Wolfe and George Vanderbilt. Many cities turn former transportation corridors into walking and biking trails. In Kansas City, Missouri, the Harry Wiggins Trolley Track Trail runs along the city’s last streetcar line, the Country Club Line, which ended service in 1957. The 6-mile trail, established in the 1990s, passes by old houses, historic churches, parks, and local businesses in the city’s Brookside and Waldo neighborhoods, and a renovated streetcar station at 54th Street and Brookside Boulevard stands as a reminder of the trail’s previous life. And long before New Orleans’ Lafitte Greenway was a popular recreational trail, it was a canal completed in 1794 by Francisco Luis Héctor, barón de Carondelet, the governor of the Spanish colony of Louisiana, to connect the Bayou St. John neighborhood to Basin Street. It later became a railroad right-of-way. But in 2005, the railroad ties were pulled out. The land sat vacant until a group of New Orleans residents formed the nonprofit Friends of Lafitte Greenway in 2006 and advocated for preserving the former rail corridor’s open space. The $9.1 million project, managed by the New Orleans Recreation Development Commission, opened in November of 2015 and connects Tréme to City Park, passing through the historic French Quarter and Faubourg St. John neighborhoods. Other cities make use of the stories their riverfronts can tell. Much of Denver’s early history occurred along the South Platte River, and today, the city’s South Platte River Trail follows the river for nearly 12 miles. Twenty-one interpretive signs fill visitors in on historic sites like Confluence Park, where prospectors gathered in the mid-19th century in search of gold. The city of Pittsburgh formed at the confluence of three rivers—the Allegheny, Monongahela, and Ohio—and today, its 24-mile Three Rivers Heritage Trail celebrates its history. Thirty-six interpretive signs cover everything from the region’s Ice Age geography to its Native American settlements to Pittsburgh Pirates baseball team lore. The trail gives trekkers easy access to sites like the Byham Theater, a turn-of-the-century vaudeville house renovated in the 1990s; the Phipps Conservatory and Botanical Gardens, opened in 1893; and the Andy Warhol Museum, located in a repurposed 1911 warehouse. 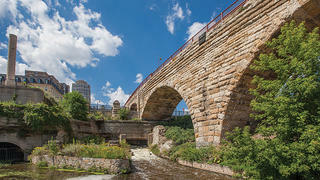 The Stone Arch Bridge and Mill Ruins Park on the St. Anthony Falls Heritage Trail in Minneapolis. Minneapolis’ once-thriving lumber and flour milling industries began at the St. Anthony Falls—the only major falls along the Mississippi River. This industrial history today is on display along the St. Anthony Falls Heritage Trail, a 1.8-mile loop around the city’s riverfront within the St. Anthony Falls Heritage Zone. One of the main attractions is the Stone Arch Bridge, built in 1883 by the Great Northern Railway tycoon James Hill, with 23 arches made from native granite and limestone. Other sites accessible from the path include the Mill City Museum, built among the ruins of an old flour mill; Water Power Park, which offers prime views of the falls; and Nicollet Island, with its Victorian-era houses and the famous Grain Belt Beer sign. The San Antonio Missions Trail, a hiking and biking trail along the San Antonio River, connects each of the city’s five Spanish Colonial-era missions: Mission San Antonio de Valero, better known as the Alamo; Mission San José, the largest mission in the city; Mission Concepción, which still has many of its original frescoes; Mission San Juan, once a self-sustaining community where artisans made iron tools and cloth; and Mission Espada, which includes the most well-preserved section of the city’s original irrigation system. The trail passes right by many of San Antonio’s historic attractions, including Villa Finale, a National Trust Historic Site. But you don’t have to stay in a city’s center to experience its history. In San Francisco’s Golden Gate National Recreation Area, the Lands End trails (pictured at top) offer clifftop walks around what was long ago the seasonal settlement of the Yelamu Ohlone tribe, and later a seaside resort destination with public gardens, an amusement park, an aquarium, and cafes. 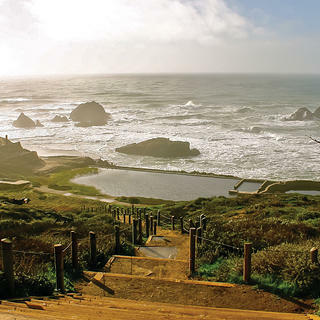 Today, hikers can explore landmarks such as the Sutro Baths ruins and the Cliff House restaurant, visit the USS San Francisco Memorial, and catch glimpses of old shipwrecks from the trail’s different lookout points. 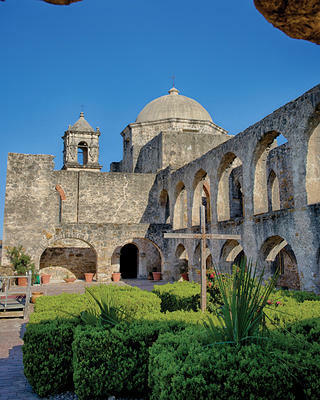 The San Antonio Missions are part of a UNESCO World Heritage Site. Nearby at the Presidio of San Francisco, a 1,500-acre park at the site where Spanish military commander Juan Bautista de Anza established a military fort in 1776, is the westernmost point of the Juan Bautista de Anza National Historic Trail. The entire trail runs 1,200 miles from Nogales, Arizona, to the Bay Area, following the path that Anza took to reach the West Coast. The Presidio section of the trail takes visitors on a pleasant 2.7-mile hike around Mountain Lake, where Anza and members of his expedition camped more than 240 years ago, and out to the Lobos Valley Overlook, where sand dunes, native plants, and a freshwater creek give hikers a sense of what San Francisco looked like long before the city’s bridges and skyscrapers were built.